Yano Research Institute (the President, Takashi Mizukoshi) has conducted a survey on the global market of sensor systems for ADAS and automatic driving and has clarified the market outline, technological trends, and business strategies at each maker of sensor systems introduced in ADAS/automatic driving, and forecasted the global market size until 2030. The global market size of sensor systems for ADAS or autonomous driving in 2017, based on the shipment values at manufacturers, has continued being on the rise to attain 895,918 million yen. In Japan, US, and Europe, AEB (Automatic Emergency Braking) has progressively become standard adoption during the period between 2016 and 2017. In order to respond to NCAP (New Car Assessment Program) in Japan and Europe, AEB has increasingly been installed not only to protect the vehicle but rather to protect pedestrians. In addition, practical use of the vehicles that attain autonomous driving level 2 (partial automation) has started from TESLA Model S in 2015 which triggered the number of level 2 vehicles to increase in 2017, launching the market of short-range radars that can detect obstacles within 100m distant from where the radars are installed, i.e., the corners of a car body. The demand of such radars are expected to expand mainly for high-end cars at autonomous driving level 2, the number of makers to newly enter the market tends to be on the rise. Furthermore, the global market size of ultrasonic radars necessary for parking assistance and unintended start prevention became 50,616 million yen in 2017. 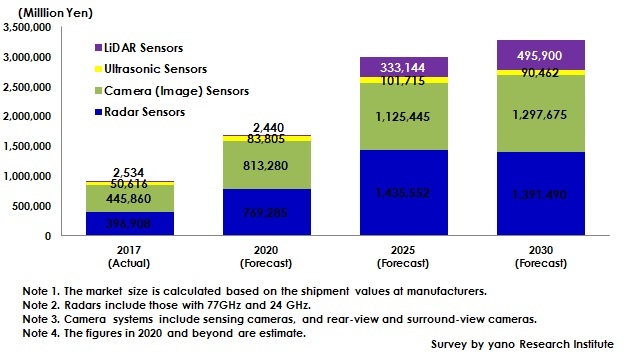 Size of the laser and LiDAR (Light Detection and Ranging/Laser Imaging Detection and Ranging) market, which consists mainly of low-cost infrared laser, reached 2,534 million yen. Sensor systems for ADAS and autonomous driving differ in the type and number to install depending on the level of autonomous driving defined by SAE (Society of Automation Engineers). In 2020 and beyond, the technological innovation and cost reduction of the systems are to be in progress in order to attain level 3 and above. The sensor systems at autonomous driving level 1 (driver assistance) and level 2 (partial automation) consist mainly of a camera and a 79GHz-based millimeter-wave radar system installed one each at front part of a vehicle. In the vehicles at level 2, short-range radar systems are needed to be introduced not only in the front but also at the four corners of a car body in order to enable partial automation, i.e. the functions such as traffic-jam driving assistance and lane changing, both with the driver’s attention. At level 3 (Conditional Automation), level 4 (High Automation) and level 5 (Complete Automation), the vehicle controls all monitoring of the environment which includes detecting of the road type whether the vehicle is on a highway or a general road (in level 3 the driver still needs to drive the car especially when the systems are inoperative), so that many automakers are considering introducing LiDAR (Light Detection and Ranging/Laser Imaging Detection, and Ranging, or laser scanner) in addition to camera systems. By installing mechanical-mirror LiDAR in front of the vehicle, Audi A8 achieves the level-3 autonomous driving, keeping the same lane of a highway, by robustly detecting obstacles surrounding the vehicle through a fusion of three different types of sensors, i.e., the systems of radars, cameras, and mechanical-mirror LiDAR. However, mechanical-mirror LiDAR currently can only be installed in high-end cars, because it has moving parts that makes it difficult to be installed in terms of size and cost. Therefore, research and development of solid-state LiDAR, which has no moving parts, have been in progress. Such products are to be vigorously marketed around 2023. Therefore, the market of solid-state LiDAR is likely to be launched in the period between 2023 and 2025, expanding detection on the sides and rear of the vehicle. In addition, because of mass production of low-cost and small, millimeter-wave radar is to start by introducing CMOS processes in 2021 and later, the number of radars to be installed in a vehicle increases to 8 to 10 for autonomous driving at level 3 and above. In addition, higher pixels are expected in camera systems, which increase adoption of CMOS sensors with more than 2 million pixels by 2020. For some vehicles by the automakers considering cameras to be the main constituent of their sensor structure of autonomous driving, the maximum number of cameras necessary to attain level 3 is eight. ​Autonomous commercial vehicles, which should mainly be level 4 and 5, have fewer restrictions in vehicle designs so that they have more liberty in securing spaces to install sensors. Since they also have room for expenses, multiple number of mechanical-mirror LiDAR can be introduced in around 2020 and beyond. Since high-pixel cameras, millimeter-wave radars, and etc. are to become objects of sensor fusion, the number of sensors to be introduced to such a vehicle reaches about 20. What are Sensor Systems for ADAS (Advanced Driving Assistant Systems)/Autonomous Driving? ADAS (Advanced Driving Assistant Systems) are the systems designed to avoid car accidents by sensing the surrounding environment of a car through sensor devices installed in front, side and/or rear parts of the car body. Several advanced driving assistant functions have been developed, which include LKS (Lane Keeping Support), ACC (Adaptive Cruise Control), AEB (Automatic Emergency Braking), and TSR (Traffic Sign Recognition). Autonomous driving is more advanced technology of ADAS. There are 6 different levels of driving automation enabled by the systems installed in a car body, such as sensors, high-precision maps, communication functions, and etc., taking the initiative of driving. Sensor systems for ADAS/autonomous driving in this research indicate various kinds of sensor units (including radar and camera systems, infrared laser, ultrasonic sensors, and etc.) equipped in front, side and/or rear parts of a car body. All such devices and components are assumed to be equipped in commercial vehicles weighing 3.5 tons or less.